A blood pregnancy test can confirm a pregnancy by checking your blood for the presence of the pregnancy hormone, human chorionic gonadotropin (hCG). There are two types of blood pregnancy tests. A qualitative hCG test simply checks to see if hCG is present, and a quantitative hCG test (beta hCG) measures the exact amount of hCG in your blood. Blood pregnancy tests will yield a positive result if they detect 5 mIU (milli-International Units per milliliter) of hCG in the blood. This level is usually seen shortly after conception. Why Have a Blood Pregnancy Test? You can choose to have a blood pregnancy test to help determine if an unintended pregnancy has occurred because of contraception failure or to see if you succeeded in getting pregnant. A blood pregnancy test can confirm a pregnancy as early as 10 days after a missed period (around 6-8 days after you have ovulated)—and sometimes, these tests can detect hCG even earlier. You must go to your doctor's office to get a blood pregnancy test. They are more sensitive than home pregnancy tests, so they can detect a pregnancy earlier. Although you can get your results very quickly with a home test, it takes longer to get the results to your blood pregnancy test. Also keep in mind that although blood tests can detect a pregnancy earlier, your doctor may not offer you a blood test unless your period is late. Qualitative Blood Serum Test: This blood test can only confirm whether or not the pregnancy hormone, hCG, is present. It basically will give you a yes (you're pregnant) or a no (you're not pregnant) result. The qualitative hCG blood test is about as accurate as a home urine test. Quantitative Blood Serum Test: This test is also known as the beta hCG test. It measures the exact amount of hCG in your blood. Because this test can detect even trace amounts of hCG, it is a very accurate test. A quantitative blood test can also help your doctor to determine if your pregnancy is progressing normally. This test is completed just like a typical blood test. The puncture site (most likely your forearm or the back of your hand) will be cleaned with an antiseptic. A tourniquet will be placed around the upper arm to apply pressure. A needle will then be inserted, and the blood will be collected in an airtight vial or a syringe. Unless your doctor's office has an in-house lab, your blood sample will be sent out to a lab to be analyzed. 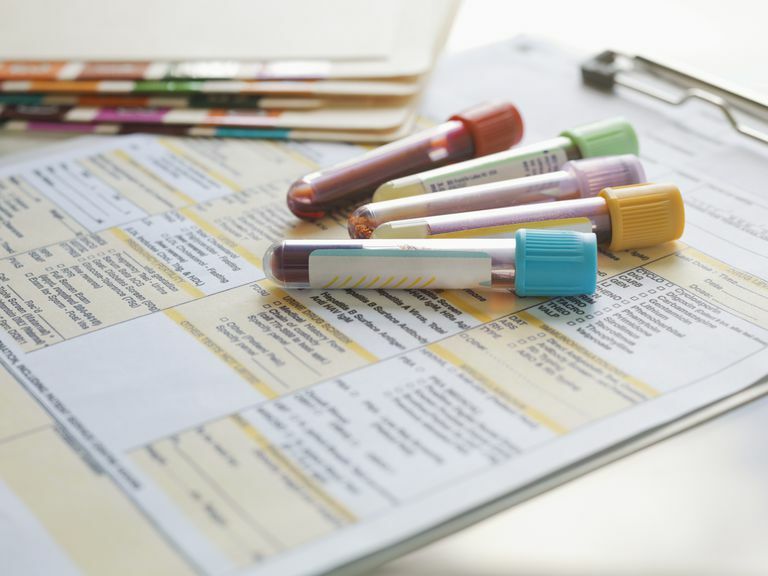 Blood pregnancy tests have a 98-99% accuracy rate. These tests can be performed around seven days after you ovulate (which is about a week before your period is due) and still provide accurate results. As with urine/home pregnancy tests, it is possible to end up with false results (both negative and positive) from a blood pregnancy test. False negative results (test is negative, but you are actually pregnant) usually occur if the blood pregnancy test was performed too early (a rule of thumb is that it takes at least 7 days after conception for the test to show a positive result). So, your negative result is because there may not be enough hCG in the blood to detect a pregnancy. Your hCG levels rise very quickly during early pregnancy. If you believe that you received a false negative result because you tested too soon, and you still have not gotten your period, you should repeat the hCG quantitative test again within 48 to 72 hours. False positive results (test is positive, but you are not pregnant) very rarely happens. You may get this result if you are taking a medication that contains hCG or due to certain medical issues. It can take longer to receive your results from a blood pregnancy test as compared to a urine test. The time it takes to receive the results from a pregnancy blood test varies from lab to lab and can range from an hour to a few days. Blood pregnancy tests must be performed your doctor's office. This may take more time out of your schedule. Blood tests are also more expensive than home pregnancy tests (with the price varying based on doctor’s and lab fees). There is very little risk associated with getting a blood pregnancy test. Just as with any blood test, there is always the chance that you may feel lightheaded, faint, have excessive bleeding, infection or bruising at the puncture site, and/or hematoma (blood accumulating under the skin). Also, since veins and arteries differ in size from one person to another (and from one side of the body to the other), getting a blood sample could be more difficult for some people than for others. In order to get the blood sample needed for this test, it may require multiple pricks to locate a vein. Burton EC. Luciani R. (2012). "Prenatal Tests and Ultrasound" Oxford: Oxford University Press.